Following a particularly violent summer storm the small lakeside community of Bridgton, Maine is bracing itself for more unusual weather. Commercial artist David Drayton, one of the town's longest standing residents decides to head into town to stock up on emergency supplies for what he assumes is an approaching weather front. He can see the mist rolling in from the other side of the lake and wants to be prepared. He leaves his wife at home picking her way through the wrecked plot and the damaged house, taking his son Billy and his cantankerous neighbour Brent Norton with him as a gesture of neighbourliness after a previous property dispute. To begin with it's emergency protocol as usual. Canned goods and orderly queues, bottled water and patience. While David and Billy are in the supermarket queue the mist rolls in, but it seems unnaturally thick, otherworldly in its slow pace, its swallowing up of sounds and straight lines, and it reduces visibility to 0%. When a town resident comes bursting into the market, bleeding and screaming about monsters in the mist it doesn't take long for order to descend into chaos. David, stranded with a few tourists and out-of-towners and a handful of familiar faces, one or two army personnel and the supermarket staff suddenly has a situation on his hands and a supermarket full of scared and desperate people. While the idea of gigantic, flesh eating colossuses from other dimensions seems far-fetched, it’s really not the point of the story, just a scenario that lets the story unfold. The characters themselves struggle to believe what’s happening to them, finding it ridiculous, impossible, even insulting that anybody could possibly suggest that this is anything other than bad weather. The main theme of the story is human behaviour, how fear, desperation and isolation can bring out unexpected character traits and turn previously rational, ordinary people into bloodthirsty monsters. Narrator David is astonished to see Ollie Weeks, the unassuming and thoroughly ordinary market assistant-manager revel himself to have a level head, a good aim and a hidden heroic streak. Mrs Carmody on the other hand, the town kook becomes a hell-fire and brimstone preacher, predicting death and carnage and the end of days. Although that's a less surprising transformation. What’s really interesting is how people change in a pressurised, enclosed environment, faced with certain death or each other. It's fascinating how quickly the pack mentality emerges and how easily people slip into us Vs them discourse. 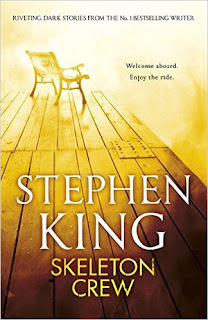 I really enjoyed The Mist and am definitely going to read some of the other stories in Skeleton Key, though this is by far the longest in the collection. 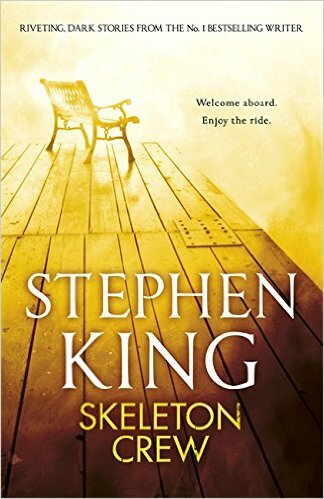 I’m always amazed at how well Stephen King can craft his narrators. They’re textbook every-men, but we get into their heads immediately with only the sparsest but most specific details. David Drayton reminded me a bit of Clayton Riddel from Cell; father and husband (arguably not a perfect example of either but doing his best) thrust into a position of leadership by supernatural forces beyond his control. He’s a very ordinary man trying to survive even though he has no idea what’s going on and people seem to want answers from him of all people. It’s hard to talk about the book without at least briefly mentioning the film. Unusually, I saw the film first which I really enjoyed, and was retrospectively impressed all over again by how closely it follows the book. Aside from a few small details it’s pretty much page for page, scene for scene right up until the end, which famously differs greatly. With the film the viewer gets two sadists for the price of one with Frank Darabont crushing your tiny ray of hope and then kicking you in the teeth for good measure. Both endings work really well, it's hard to choose one over the other. What are identical stories branch off into two totally different endings that induce completely different feelings in the audience. I can't stop being impressed by Stephen King and beat myself up every time for avoiding him for so long. The Mist, for such a short book, is really atmospheric, incredibly tense and filled with memorable characters. It’s a survival story, and just like any other flavour of apocalypse, it’s about the human instinct for self-preservation and the unfortunate mental competition between survival and insanity that seems to determine whether or not a person can survive the end of the world. I would very much recommend this as an excellent way in for new SK readers- though brief it has all of his classic elements.